Facebook launched new social launcher for Android phone called Facebook Home – The Family of apps that puts your friends at the heart of your phone. Facebook Home basically a home replacement launcher that turns your Android phone into a full fledge Facebook phone where you can deeply interact with your friends while doing other things. When you turn your phone or press the home button, the Facebook Home will greet you with a stream of posts from News Feed. Cover feed puts the spotlight on whatever friends are sharing now—photos, status updates, links and more. Notifications about calls, events, Facebook updates and other apps appear on your home screen. When you have finished reading those notifications, you can swipe away to clear the notification. This is the best feature I like in Facebook Home. From this user can start messaging with friends without switching your current app. Suppose you’re reading the news and suddenly your friend ping you. A small icon with your friend photo pop up on your screen and you can tap on that icon to view the message. No matter what you’re doing, Chat Heads will work from anywhere like web page, photos, other apps even on games. And It supports group chat too. Since it’s launcher, you can access all other apps from App launcher and you drag the list of fav. apps so you can quickly access app from app launcher. Move your profile picture to quickly get to all of the important stuff on your phone. Drag left to see your messages or start chatting with a friend. Drag up to open your app launcher or post to Facebook. And drag to the right to go back to whatever app you used last. 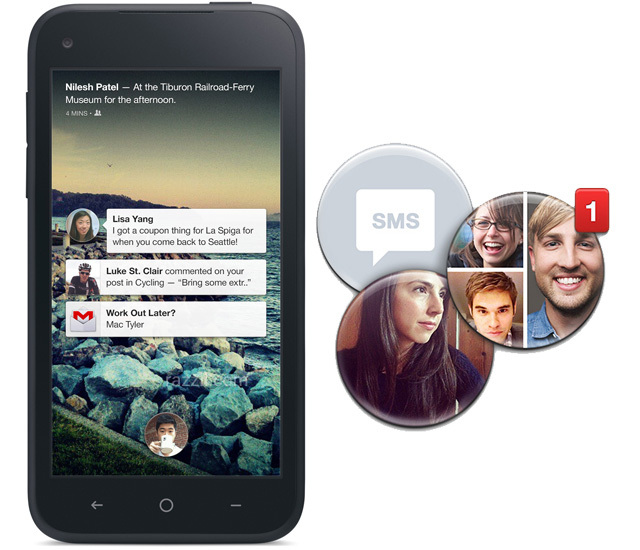 Facebook Home for Android will be available for download from the Google Play Store on certain devices, including the HTC One X, HTC One X+, Samsung Galaxy S III and Samsung Galaxy Note II on April 12.